See also general Advent songs. Come let us go to the mountain of God; swords into ploughshares. Cha673 / URW145 Gonna Lay Down My Sword and Shield / Down by the Riverside (African-American) A good traditional and fun song to sing if you are focussing on the "study war no more" part of the reading. Good for kids. Oldy-but-a-goody. *CH716 / VU374 / FFS10 / SFFS 2128 / W&R477 / Cha575 Come and find the quiet centre (Murray) A good song for the beginning of worship. I would prefer to sing this to one of the more traditional melodies offered (Tune 1 in FFS) or BEACH SPRING (TiS 493). *NCH107 / LBW633 / ELW242 / GtG107 / GC346 / GC(II)351 / G(3)423 / W&R160 / Cha138 / Lau157 Awake Awake and greet the new morn (Haugen) Joyful Advent song, looking forward to justice and healing of all. Sheet music and lyric samples. Iona (Sent By The Lord) / CH275 / VU34 / ELW247 / A&M029 / SFFS 2232 / GtG103 / CP588 / W&R157 / SP10 / STB241 / URW415 Come now O Prince of peace / O-So-So (Lee) A lovely simple and gentle song, inclusive for God and people. One of very few songs from Asia in Western hymnals. AoV1-071 / GA530 / GC(II)742 / G(3)837 / Lau462 Gather Your People (Hurd) Excellent eucharistic theology. Sound sample. Lyric and sheet music sample. *G(II)525 / GC727 / A&M560 / SP244 / URW335 How Good It Is, what pleasure comes (Duck) Good words celebrating the joy of a faithful community. Sung to a familiar shape note tune. Lyrics and sample sheet music. Midi file of tune. ATFG510 Sing a song of praise and glory / Advent News (Schmidt) A fun and simple advent song - would be good any week of Advent, but fits particularly well this week. Good for kids. Glad to go to God's house - pray for peace - suggestions for the Hebrew Scripture Lesson would also fit well. 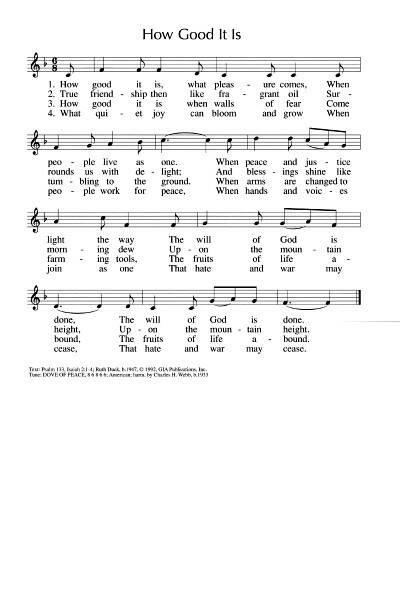 CH083 / A&M292 / GtG400 / PfAS122B / SP112 / URW321 / StF026 / Lau992 I Rejoiced when I heard them say (Bernadette Farrell) A really lovely and simple to sing arrangement of this Psalm, with a chorus of "Shalom, shalom, the peace of God be here. Shalom, shalom, God's justice be ever near". URW suggests passing the peace during the refrain if desired. Sound sample. G(II)108 / GC121 / PfAS122D I Was Glad when they said to me (David Haas) A call and response refrain to ths Psalm. Simple, and effective. PfAS122D(ii) Dona dona dona nobis pacem (Hermann Rauhe) A very simple round. I'm not sure why you wouldn't just sing the well known folk Dona Nobis Pacem instead though. That too would make a good Psalm refrain. AoV1-106 / UMH376 / WoV774 / ELW753 / GtG752 / G(II)528 / GC730 / GC(II)724 / G(3)822 / CP562 / Cha297 / URW443 / 82Hml-712 / Lau904 / LUYH073 Dona Nobis Pacem (American folk song) This is very well known, and would fit well with this reading as a Psalm refrain. Good for kids. Oldy-but-a-goody. NCH741 I was glad when they said unto me (Wooten) Very simple and straightforward chorus for this Psalm. *Emergent Psalter Because of the house of the Lord your God (Isaac Everett) A good and simple Psalm refrain. Refrain only for download. AoV1-190 / UMH431 / HPP308 / G(II)529 / GC731 / GC(II)723 / W&R614 / Cha677 / G(3)829 Let There Be Peace on Earth and let it begin with me (Miller/Jackson) Well known, and great for older kids. AoV changes "Brothers all are we, let me walk with my brother" to "We are family. Let us walk with each other". Good for kids. Lyrics. Oldy-but-a-goody. 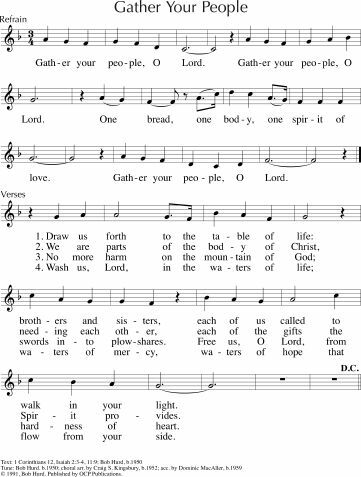 G(II)108 / GC121 / PfAS122D I Was Glad when they said to me (Haas) A pretty decent arrangement of this Psalm; I like how PfAS has it arranged as a call and response. I'm not terribly inspired by it, but it's fine really. Sheet music and lyrics. Midi. Cha761 God has made me glad (von Brethorst) This is a psalm response using that old chorus probably best known as "He has made me glad". I think this could work fairly well as it would be very familiar, particularly for slightly older congregations. Good for kids. Oldy-but-a-goody. PfAS122A Rejoice rejoice come sing with me (Adam Tice) Joyful call and response, sung to the tune FOREST GREEN. Happy! NCH112 Keep awake be always ready (Clyde) Yes, it works for this reading too. Excellent words about Christ's coming to bring peace. It's sung to the tune for "Wake awake for night is flying", but is not simply a "rewrite". I particularly like the second verse of this one. "Rise and shine for One is coming whose love will quench all nature's thirsting to be made whole for evermore". Taizé / CH276 / VU22 / GtG090 / ELW262 / GA283 / A&M053 / G(II)256 / GC332 / GC(II)340 / G(3)406 / CP094 / W&R166 / PfAS037B / SP28 / URW396 / Lau088 Wait for the Lord (Berthier) "Wait for the Lord whose day is near, wait for the lord, keep watch, take heart". A lovely simple Taizé chant. Some older versions are not inclusive. Sheet music, translations and sound samples. TiS 630 / AHB 554 The law of Christ alone can make us free (McAuley) …and love is the fulfilling of the law. A good song with excellent words from an Australian poet. Not entirely enclusive. The tune may be tricky if not familiar, so you may need to introduce the melody to your congregation. *NCH089 / 82Hml-009 Awake awake to love and work (Studdert-Kennedy) Easy to sing and wonderful words of getting up and getting going in doing what's needed. I especially like the 3rd verse. Sung to the familiar tune MORNING SONG. Lyrics. No-one knows the day or the hour. Keep awake! Be ready! See the General Advent suggestions. STB202 Jesus the Lord stands with the poor (O'Grady) Excellent words of Christ in the poor, the victim, the beggar. Powerful. 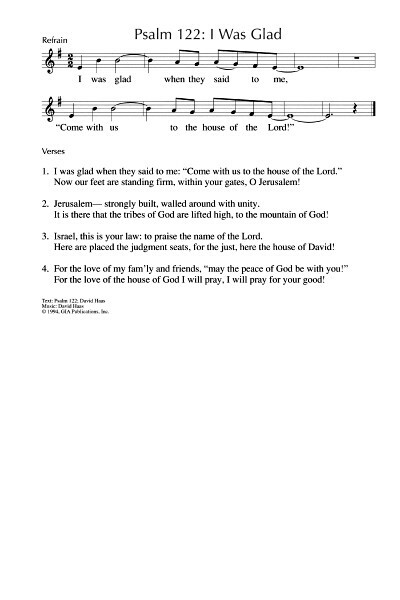 *MV19 Maranatha This simple chant, simply “Maranatha, Maranatha, Come Lord Jesus, come” might work well if you are having a more meditative approach to the Advent season. Recorded music I want to be ready when Jesus comes (Dottie Peoples) This could be fun if you have a little gospel choir and it fits the reading really well. Youtube. Lyrics. Recorded Music I want to be ready (Ben Harper) I love Ben Harper, and this will work for some congregations... Sound sample on youtube. Share your ideas below, especially if there's a great song that I've missed!